Blog Nov 14, 2018 | by Sarah Haecker Meeks, PhD and Michael Roberts, PhD, Synpromics Ltd. Recent technology advancements have enabled the opportunity to increase the efficiency, efficacy and safety of gene and cell-based medicines for a multitude of genetic disorders. To date, a major challenge facing the field has been the ability to deliver therapeutic genes to affected cell types. However, recent results from clinical gene therapy trials have provided evidence that, at least for some diseases, this challenge has been overcome. For example, adeno-associated virus (AAV) vectors have been used to successfully deliver therapeutic genes to the liver, retina, and brain. Also, lentiviral vectors have been used successfully to deliver therapeutic genes to hematopoetic stem cells ex vivo and these modified cells have been used to treat immune, hematologic, and neurologic diseases, a prime example being CAR-T therapy for treating cancer. From here, as product developers move toward next generation expression constructs, the importance of tight, targeted and robust gene regulation and novel promoter elements has emerged. The suitability of a recombinant virus for liver gene transfer is based on several factors, including the infectious titer that can be achieved, the ability of the virus to infect nondividing cells, the efficiency of integration into the host genome, the repeatability of administration, limited immune responses to the virus and the transgene, and the safety of the vector system. At present, there are 4 significant barriers to successful viral gene therapy. These include (1) uptake, transport, and uncoating of the virus; (2) vector genome persistence; (3) transcriptional persistence; and (4) the immune response. Efficient transduction of human hepatocytes is critical for the successful application of AAV-mediated gene therapy for the treatment of liver disease. Optimization of transcriptional control elements can improve transgene expression in the liver. An AAV product can be engineered to restrict the expression of transgenes following different systemic routes of administration, but the addition of a tissue-specific promoter to selectively drive expression of the transgene significantly enhances the safety profile of the vector, as it will (a) de-target expression from antigen-presenting cells and hence dampen the immune response; and (b) restrict expression in non-target cells and hence reduce the chances of potentially damaging off-target side effects. Synpromics has developed a technology platform, PROMPT® and a proprietary machine learning methodology to create libraries of promoter candidates that are designed and developed according to a discreet set of specifications. These specifications can include the size of the promoter, the tissue, cell or multiple cell type selectivity of the promoter, and the strength of the promoter. Specifications can also include whether the promoter is constitutively expressed in the target cell type(s) or is regulated or inducible in the cell. These promoters can be designed for both in vivo gene medicine (replacement therapy or genome editing) or ex vivo gene modified cell therapy applications as well. New promoters are required to drive efficient, yet finely tuned, gene expression so that the therapeutic effect is safe, directed and durable above and beyond what the vector capsid may confer. In addition, given that the target gene can be delivered using immunogenic vectors (both viral and cellular) and that the therapeutic gene is often new to self, long-term immune responses to the therapeutic cassette need to be minimized. 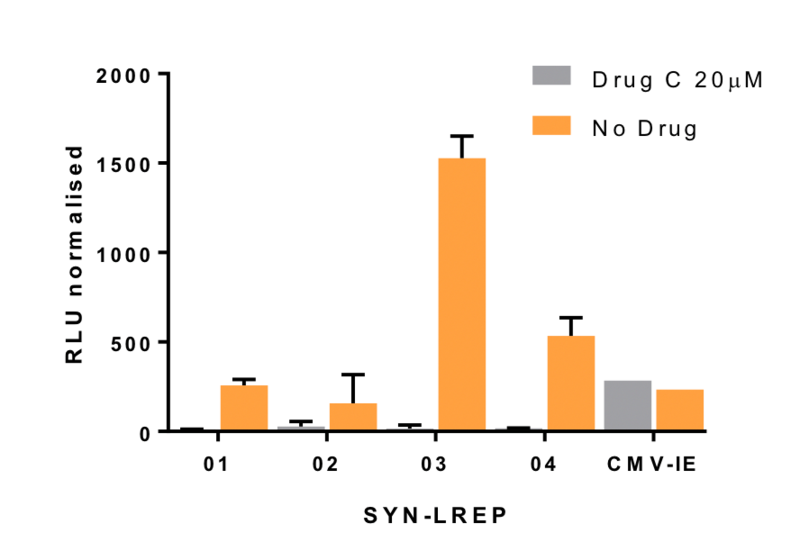 To address these issues, Synpromics has built out its synthetic promoter platform to meet the discreet needs of gene medicine product developers. The three figures below are examples of novel promoter systems designed to improve liver directed gene medicines. Strength and size are used to increase potency (Figure 1), tight gene regulation is achieved through orally controlled and pharmacologically responsive inducible systems (Figure 2) and repressible systems (Figure 3). These potentially improve safety and efficacy and enable otherwise non-addressable gene medicine targets. 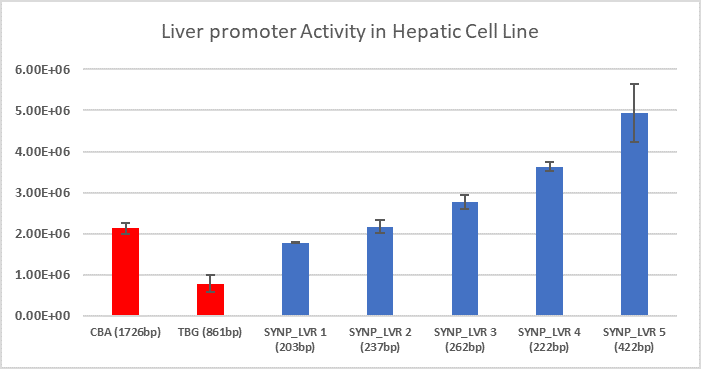 Figure 1: 2nd Generation Constitutive Liver Selective Promoters: The Huh-7 liver cell line was transfected with five different liver selective synthetic promoters developed by Synpromics (blue bars) and two control constructs; CBA; a ubiquitous promoter, and TBG, a liver-selective promoter (red bars). The Synpromics promoters ranged from 2- to 5-fold more active than TBG, and equal or 2-fold more active than the CBA promoter. Moreover, the synthetic promoters are significantly smaller than control promoters, making them ideal for insertion into the AAV vector genome. Critical to the continued development of all gene medicines is a keen understanding of the optimal context of the regulatory elements in the gene product expression cassette. This includes a focus on the role of terminal repeats in viral-based constructs as the expression cassette needs to be designed to optimize the relationship between the inverted terminal repeats (ITRs) and the promoter and regulatory elements because misplacement can influence promoter activity in both a positive and negative manner. In addition, smart gene medicine design concentrates on the role of the intron in the context of the expression cassette. Introns control the processing of mRNA and are hence a key post-transcriptional pathway and when engineered into an expression cassette allow for more efficient translation in vivo. Introns can also be leveraged to further regulate protein expression levels through post-transcriptional control mechanisms. Finally, since 5’/3’ UTRs confer stability to the mRNA, they should also be incorporated into designs and it is important to identify UTRs that can further influence protein expression. Synpromics’s cassette design takes all these elements into account. Figure 2: Liver Selective Inducible - Drug Induced, dose responsive promoters (A): Primary hepatocytes transiently transfected with Liver-specific drug-inducible (LIND) promoter driving expression of Erythropoietin. Promoters show dose-responsive profile with maximum activity achieved with the addition of 2uM. Activity is cell-type selective with no activity seen in in non-hepatic cells. Derivatives of the LIND promoter show varying degrees of expression strength. Currently armed with optimized capsids, gene medicine product developers have now focused their efforts on employing novel technologies and synthetic promoter systems to more accurately target and fine tune tissue expression in a multitude of tissues including the liver. At Synpromics, we are developing innovative synthetic promoters and novel regulatory systems to match the sector need for gene therapies with tighter and more accurate transcriptional control. These improvements will advance current product development and importantly enable future improvements to address more complex liver disorders.